Trump says the country is falling apart, but White House Chief of Staff Dennis McDonough says he’s baffled why Trump and the other Republican Presidential candidates would say this. Really? Don’t you think they kind of need some problems to match their solutions if they want to have “a narrative”? As I continue to say, Donald Trump embodies every principle of narrative presented in my new book. He is the living demonstration of the power of narrative — NOT storytelling — is everyone aware of the difference? “I DON’T REALLY GET IT.” Well, that’s the truth, Mr. McDonough. At least he’s honest about it. But what’s not to get about Trump? It’s about narrative. Trump has a mastery of it, people on the left don’t. It’s kind of that simple. His speech last Thursday in Vermont was a tour de force of his narrative skills. Not storytelling. He’s a lousy, choppy storyteller. He’s no Ronald Reagan. But what he knows is narrative. Narrative is about “problem-solution.” It is at the core of storytelling, but it’s only one part of a story. 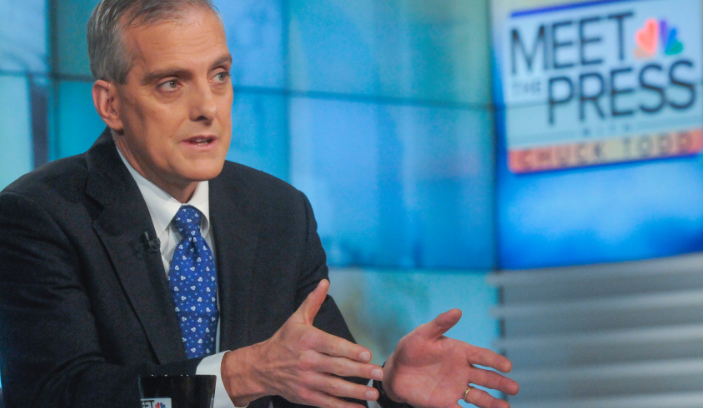 Yesterday on “Meet the Press” White House Chief of Staff Denis McDonough sat there sounding totally confused as Chuck Todd asked him about Trump’s penchant for saying the nation is on fire and about to explode. Well, I understand why. It’s kind of simple. Without problems, you can’t have solutions. And without problems and solutions, you have no narrative. Trump gets this better than all the rest — so much that he has his narrative on his hat, “Make America Great Again.” There’s the statement of the problem in his view — that America has slipped. He gets this stuff. He’s spinning absolute circles around his opponents and the left is utterly lost. There are dark days ahead. That’s my fear-mongering statement of the problem.